You guys and gals. Great job last week, and we had great interest in our annual "First 1 out, Last one in" contest. In fact, 12 of you are still in the running. For the first time in the history of our annual "First 1 out, Last one in" contest, all the 1s survived the first weekend and only one double-seed advanced to the Sweet 16. So here are the 12 of the 58 entries that had 12-seed Oregon, which topped my entry of UC Irvine, and the array of the one seeds they coupled with the Ducks. Oregon-Virginia, congrats to Ted T, Ernie H, Chas, Alejandro, Ted P, scole023, and Hank H; Oregon-Gonzaga, congrats to Justin F, Jason T, and Scott S; Mike R had Oregon and UNC (he was one of three to pick UNC to be the first 1 bounced) and congrats to Brent R who had Oregon and Duke. Brent R, who likely should have won Sunday considering how Duke-UCF played out, was one of two who had Duke as the first 1 out. Center Road. Yes, the handle sounds like a regular poster on interweb sites like this one. But Center Road is the tag name for the entry that has a still perfect bracket heading into the Sweet 16 of the tournament. A perfect run through 48 games breaks the previous record of 39 straight in 2017. For those curious, Center Road has all chalk through the Sweet 16. If that happens it would be the first time in the 34-year modern-era history of the expanded tournament that the Elite Eight was all 1s and 2s. Rob Gronkowski. There were always side stories about the Polar Bear running down the middle of the field. He was shirtless at parades and chugged beers at almost every turn. Yes, he even — somehow in this day and age — got a pass on some offensive humor directed at female sports reporters. But there was never debating Gronk's ability or, in the end, his business plan. Rob Gronkowski retired Sunday at the tender age of 29. By all reports, he lived off bonuses and endorsement deals, saving all the base salary — some $33-plus million https://overthecap.com/player/rob-gronkowski/1239/ — from all his contracts in his nine-year career. Dude is walking away — while he is still able to walk — and has a slew of opportunities in front of him. (Here's betting any amount of money that Gronk will be at WWF Raw tonight, which happens to be in Boston.) That's a guy who played the actual game very well and played the BID-ness game even better. Kudos. Donald Trump. The Mueller Report was released Friday afternoon during the NCAA tournament. (Is there a more covered placed to release big news than the Friday afternoon of the NCAA tournament? Seriously?) Well, for all the consternation and all the finger pointing and anticipatory allegations about the President's role in alleged Russian involvement in the 2016 election, according to U.S. attorney general William Barr, there was no evidence to charge the Trump or his campaign in (Yes, the obstruction charges were not as clearly dismissed by Barr, but there was not enough evidence to charge him.) That Democrats are using the "not a neutral observer" claims on Barr or Mueller scream of desperation and grade-school-attempts of bias. In truth, this report and Barr's summary, are a chance for Trump to redirect his presidency in a lot of ways with this now behind him. And, regardless of your political leanings, even if you wanted Trump indicted and removed immediately, this is actually good news for the country as a whole. No, this is not endorsing one party or the other. It's a simple acknowledgement that the mess/political disaster that Russian operatives influenced our presidential election would be a nightmare for democracy and America as a whole. Plain and simple. 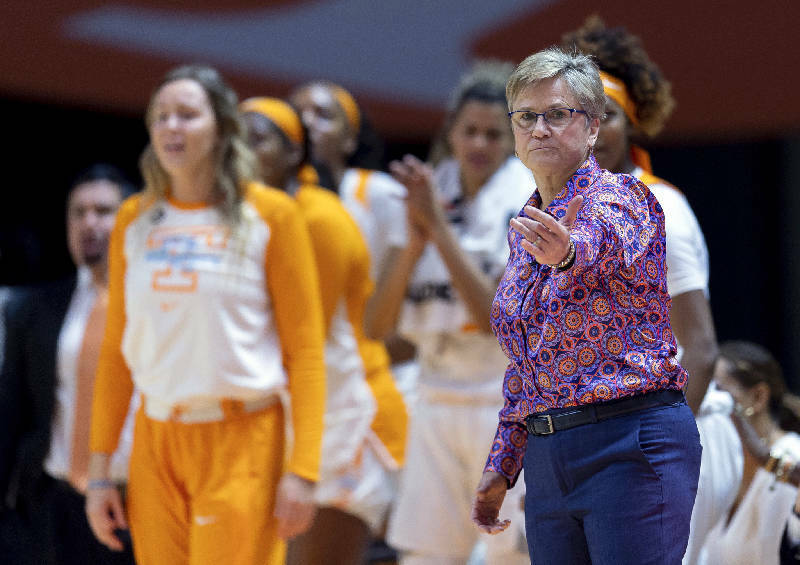 Tennessee women's basketball coach Holly Warlick will take the Lady Vols into the NCAA tournament for the seventh time in as many seasons leading the program. The Lady Vols are the Albany Region's No. 11 seed, though, and have the worst RPI of any at-large team in the bracket. Boston Celtics. Losers of four straight and reeling. Saturday, the C's were outscored 30-5 down the stretch and lost by 7 to Charlotte. Sunday, San Antonio got 48 points fro LaMarcus Aldridge — and while he may be the best LaMarcus of all time, he's not an all-timer — and waltzed. To make matters more complicated, Kyrie Irving has become equal parts NBA Hall of Famer and moody third-grader. Seriously. Wofford sharpshooter Fletcher Magee had an amazing career. An overachiever of the highest magnitude who simply made himself into an NBA player went 0-for-12 from 3 against Kentucky. It was the most misses from 3 without a make in NCAA tournament history. That it came from a great kid who was the all-time leader in 3s made in NCAA history is even more astounding. Here's betting Magee will revisit this one for a long time to come. Speaking of Wofford, there was a dude in The Mirage bet $110K to win $100 on Wofford plus-5. Tyler Herro's two free throws with less than 5 seconds left pushed the margin to 6, which is where it finished after Wofford missed another 3 at the buzzer. State of Mississippi hoops. In what otherwise was a great weekend for SEC hoops, Ole Miss and Mississippi State were bounced in round one. Holly Warlick. She got into the tournament. And she got bounced. Did we really expect anything else? Bonus pick: LeBron James. We have not watched a lot of NBA — heck last week, other than some bits and pieces of the NCAA tournament, we did not watch a lot of anything — but the Lakers failing to make the playoffs will forever be a stain on LeBron's legacy. And that it likely will cost Luke Walton his gig only adds another line item as James a coach killer. Not a lot of upsets. Only Oregon lives as a double-digit seed. All the 1s and 2s are still in the mix. Here are a quick four corners of opinions form the Dance's early steps. Kudos SEC. Four teams in the Sweet 16, and Auburn's first-half explosion against Kansas was arguably the best 20 minutes by any team at any time of the tournament. From SEC historian/guru David Paschall, this is only the third time the SEC has had four Sweet 16 teams. Among them is Tennessee, which survived a second-half meltdown Sunday and a much-closer-than-expected round one win. Please remember kids, that the only thing that matters now is the W. Period. As much as I hate to admit it, Gonzaga — yes, Spy, Gonzaga — and UNC look to be the class of the tournament through two games. Finally, we feel obligated to discuss the Tom Izzo deal. First, we all understand the emotions at play for the coaches and players at these high levels of college sports. We understand the passion. We, more than most, are quick to point to the "participation trophy" culture as a prime reason for the softening of a generation. We certainly understand and appreciate all of the Michigan State players coming to the defense of Izzo, who simply lost his bleep on a freshman during the Spartans' first-round game. There are a slew of ways to reach players, and Izzo more than anyone inside or outside his program certainly knows the best ways to reach his team. I get all of that, but there has to be a middle ground right. Hey chew the kid's tail — even in public if needed — but needing to be refrained by other MSU players? C'mon coach be better than that. And Izzo's sarcastic and dismissive Sunday news conference answer was just icing on "blame the media" cake. There has to be a middle ground that can be tilled here right? This does not have to be a all-or-nothing hill. Because I do know this: People everywhere are defending Izzo, the multi-millionaire coach for publicly blasting a teenager, but if the teenager turned and publicly did that to Izzo in return — or chewed one of his teammates in that manner — would he get the same defense of "tough love" and "leader/motivator" and all the rest? — Speaking of the Vols, kudos to Weeds and Gene of Many Hats for their great UT hoops coverage from Columbus. Well done gents. — To that point, what a great effort for the UCF Knights. Wow. And as great as Aubrey Dawkins was, his late-game miscues — he mishandled an alley-oop that became a five-point swing and he missed the block-out that became the game-winner — and his physics-defying tip-in that rolled out will haunt that program and that kid for a while. — Robert Kraft is digging his heels in. He issued an apology this weekend, but he and his attorneys are refusing all deals in regard to his solicitation charges in Florida. He is due in court on Thursday. — Our AA picks continue to be mired in mediocrity. We hit on Orlando minus-9 (a 36-6 win over hapless Atlanta) and San Antonio minus-3.5 (a 19-15 win over Salt Lake) and missed on San Diego plus-3.5 (lost to Arizona 32-15) and Birmingham minus-3 (lost to Memphis 31-25 in overtime). Yes, the Birmingham loss was a tough, Tough, TOUGH beat. We are at that very minuscule entertainment number of 19-17 against the AAF number. — Starting tomorrow, we will have some MLB preview stuff in advance of the start of the season in earnest on Thursday. — Vegas got hammered on Saturday and Sunday. All 16 betting favorites — the sides the public normally leans toward — won in the round of 32. Ouch-standing. 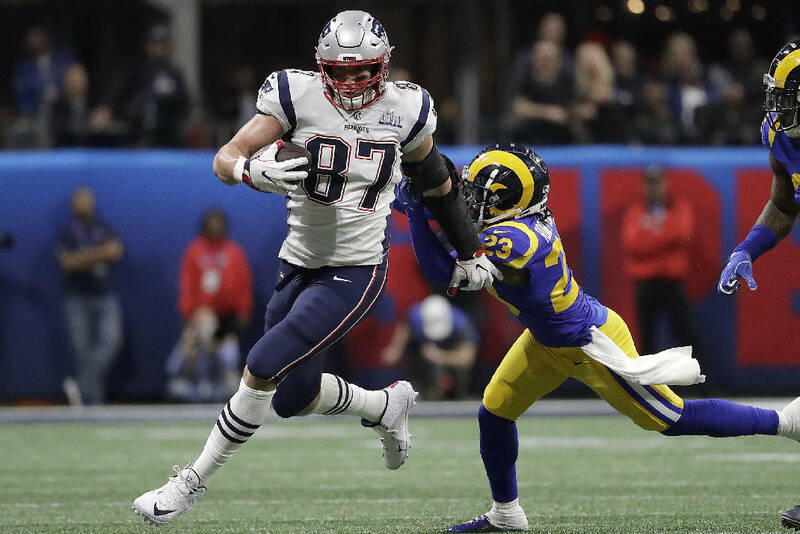 Is Rob Gronkowski a first-ballot Hall of Famer? Would you take Ja Morant or Zion Williamson if you had the No. 1 overall pick? As for today, March 25, let's look. Hey, it's Elton John's birthday. Rushmore of Elton John tunes. Go.